Transitions – that time in life when change becomes inevitable. Or, at the very least, expected. Definitely not always looked forward to. Sometimes even feared. Or avoided. I like the notion of transitioning into a butterfly. I have even written a children’s story about butterflies and posted it on to my blog in an eight part series titled “Salma Butterfly’. There is something very beautiful about the way a butterfly transitions from one stage of its life cycle to the next. As it does, it totally transforms itself. So much so that in its final stage it bears no resemblance to how it started out in life. It’s a wonderful metaphor for our lives. We transform – grow – change. The wear and tear of life leaves its marks on our physical form. The wrinkles we carry are an outward manifestation of our transformation. Wear them with pride! We work long and hard to earn these medals as signs of courage, bravery and growth. Why don’t you feel good yet, even if it’s a good change? Because you haven’t located yourself yet in your new context. You are literally in transition. Think of transition as a place in and of itself. You’re not totally lost and disoriented, you’re merely between contexts. …. Regardless of the specifics, transitions have roughly three predictable stages. Know which one you’re in: That, in and of itself, will curtail the feeling of disorientation. Characterized by doing more than feeling. You’re gathering information on how to make this work, making choices, making connections, asking questions, digging in. This is the stage you don’t notice because it doesn’t feel like a stage. You’ve arrived at your new destination. You’re accepting and incorporating the new so much, you wouldn’t have it any other way: The new is the (new) old. Don’t Expect to Feel Fantastic at First: Expect the Opposite – The way to be gracious (and cut down on your anguish) is not to expect that you’ll have a seamless process, but actually expect the opposite. Fast Forward to the End and Put a Time Frame on the Adjustment – Estimate how long you think it will take to settle into the new routine. Don’t Forget to Add Yourself to the Equation – You may feel powerless against change, but you’re in the picture, too. How did all those previous changes get worked through? You can be sure that you had something (a lot) to do with that. All the tools and experience that you bring to the situation are there for you. What Changes, What Doesn’t? – Appreciating what doesn’t need your attention may give you more energy to face head-on what does. Sounds like good advice, doesn’t it?! Change comes to us all in many ways. Throughout our whole life. It presents challenges. It also fosters great growth if we have the courage to work with it and allow it to flow, teach us what we need to learn and integrate. John O’Donohue, the Celtic priest, author and poet, in his book ‘Anam Cara’ writes about transitions – life changes. He writes of seasons of the heart, the art of inner harvesting and experiences through the times of our lives as being etched in our Soul and our memories. I find these beautiful and comforting images. I have been reflecting on the whole notion of transition because a major one has just entered our lives. You see, my husband recently retired. So in our household we are living through the process of mastering transition. It affects all of us to some degree. Him most of all of course. And me next as the person closest to him. The kids sort of drift around the edges too absorbed in their own worlds to take too much note of what the olds are up to. I can see him stepping in and out of all the three stages, sometimes all in the one day. Akin to the process of grief, it does not flow neatly from one stage to the next. It jumps around all over the place until it finally resolves and settles into the ‘new old’. 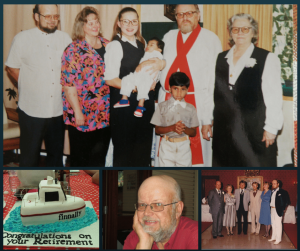 As I prepared for his retirement party, I came across an article in a magazine. It was called ‘The Retired Husband Syndrome’. I thought it was some sort of joke. Until I read it. It is something we wives/partners can suffer from. I found a whole lot of websites addressing the issue, its seriousness, and how to overcome it. Wives who have run the household for the last forty years suddenly can find themselves with a husband under foot wanting to be involved in the minutiae which previously they were oblivious to. Hence the importance of preparing for the transition. The importance of having hobbies, interests, activities and projects to be involved in becomes critical . Not just during the transition, but in moving forward into a happily retired life. I’m pleased to say that I will not fall victim to Retired Husband Syndrome. If he can’t find things to do himself, I have a list a mile long ready for him! closer to you and become one with you. wonderful love in your self for your self. May your life transitions flow with ease and grace.